Google AdWords Quality Score is a measure of how relevant your ads and landing page experience are for your target audience. New data available in your AdWords campaigns gives us more insight into the quality score and how to improve it, if you know how. In AdWords, the quality score is a number assigned to your ads based on how likely someone is to click on your ad; how relevant your ad is to the target keyword; and the experience that your landing page provides to visitors. Quality score is evaluated for every keyword in your campaign and is then used in the bid auction; enabling higher quality ad/keyword combinations to appear at better positions and pay less per click. The problem for advertisers is that while your quality score is a good indication of the quality of your keyword, ad and landing page, it is not so easy to see which components of your quality score are good or bad. So if you had a quality score of 5, it is obvious that you could improve it, but not so clear whether it is an issue with your relevance, landing page, or click through rate. With these new columns, you can quickly see if it is your ad relevance or landing page experience that is holding back your quality score, and fix it! But that is not the only new information available. Google also added another new column called "Quality Score (Hist.)" which will show you how your quality score has changed over time. So now, not only do you have the ability to clearly see each factor of quality score and what needs improving, but you can also see the impact of your changes over time. HOW TO LEVERAGE THIS DATA? Google has given us a great deal of valuable information with these new changes, but it is up to advertisers and agencies to take that data and make the necessary changes to improve quality score. Start by sorting your keywords into those that have low ad relevance, poor landing page experience, and low click-through rates. Have a look at the ads that display for each keyword. If your relevance is low, it usually means your keywords do not match your ads as well as they could. Create new, more targeted ad groups with closer matching keywords and ad creative. Once you have done this, move on to your poor landing page experience keywords. Before making any significant changes to your landing pages, look at your basic page performance. Does it load quickly (under 2 seconds is recommended), and with no major errors? Are files compressed and minimised? Is your site designed for Mobile first? Does it pass the AMP test (https://search.google.com/test/amp)? When you are confident your site is working well, move onto the content and see if the keywords in your campaign and newly reviewed ads flow onto the landing page. Create custom landing pages for those that may be less relevant and update your ads to direct users to these pages. When you are satisfied with your landing pages, it is time to tackle the last issue, which is the expected click-through rate (CTR). The most common (and most often ignored) reason for low CTR is that your ads may be appearing at low positions. Have a good look at your average position, especially for keywords that show strong 'intent' (i.e. keywords where users indicate they are looking to purchase or make a decision). Low average positions result in low click-through rates as many people will not scroll down to view your ad; especially on mobile devices. You will want to decide if you want to bid higher on your ads, increasing the CTR and improving quality score, or keep your keywords at low positions because the increased volume of traffic will have a negative impact on your return-on-investment (ROI). Using the new historical quality score data column, you will be able to see how your keyword quality score changes in the days following your updates. If your keywords are getting reasonable volumes of traffic, you should find within a few days if your changes were effective or not. 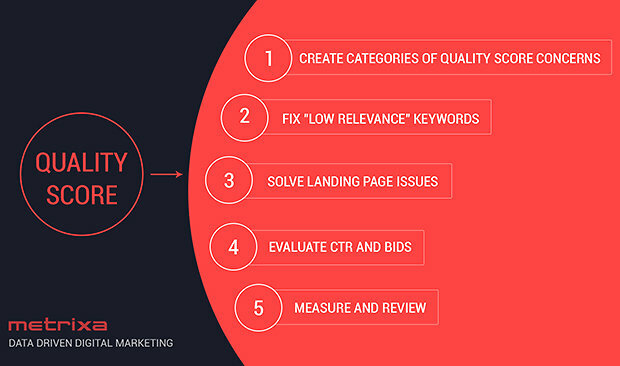 Repeat the process of updating and reviewing the outcomes and over time you will find that your quality score will increase, cost-per-click will decrease and you will get more from your marketing budget.